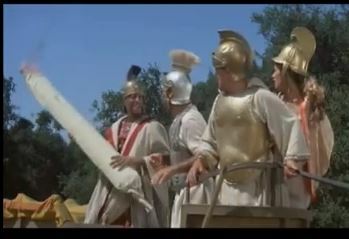 My brother posted a news story from a celebration on a Santa Cruz college campus on 4/20 with the caption, “Roman Red.” It inspired me to post this kind vid from History of The World Part 1. This clip more than speaks for itself, but if it doesn’t, I’ll try. Gregory Hines, wearing an ill-fitting Roman soldier uniform jumped off the back of a chariot into field of funny looking plants, asking for “papyrus! Rolling papyrus!” It was one of the highlights of an already bright career. Watch for my two favorite lines: “You people don’t know the value.” and “Let the coolness get into our vertebrae.” Please add your own in the comments. This entry was posted in History of the World Pt 1, Tuesday Tribute and tagged Gregory Hines, History of the World, Mighty Joint, Rolling Papyrus. Bookmark the permalink. This is brilliant timing, because less than two hours ago, I added White Nights to my Netflix queue. I finally decided that if my husband gets crappy kung-fu movies on his Netflix, I get some tap-dancing Cold War business. They can pry our Cold War tap-dancing movies from our cold dead hands! Don’t shoot me in the back!